I had a dream last night about the Christmas Eve open house party I used to go to every year when I lived “up North.” I dreamed that I got there late and all that was left over was already on ice except for some great Italian bread that was freshly baked and still warm. What does this dream mean? I have no idea. But I thought about things I’ve done during this holiday season as compared to holiday seasons in the past. What do I do now that I used to do then? What have I dropped, and what have I picked up? Driving around neighborhoods to see everyone’s decorations. When I was a kid, there was someone two blocks away that always had Santa and the sleigh and the reindeer on the roof, lit up so everyone could see them at night. It was extra effective if it had snowed, and the light could reflect off the white on the roof. This, among other showcases, was a tradition. When I got older, we’d drive along Route 35 along the Jersey Shore, past those huge houses in Mantoloking, and a lot of them (if they hadn’t closed up for winter yet) would put on quite a display. Then, once I moved down to Florida, and started living in apartment complexes, I thought I wouldn’t get to see much in the way of holiday decorations. Boy was I wrong! It’s amazing what people can put out on a lanai to make it look like a store window! Philosophy’s Have a Cherry Christmas Bubble Bath. This little set was an Ulta doorbuster for Black Friday. It has a small gel and a lip gloss. And it will take the place of Bath and Body Works’ Winter Candy Apple in the future, unless I can’t get it for some reason. The Griswold Family Christmas. It’s not Christmas without this movie. Bingo! This is the movie that inspired so many people to get vanity plates for their trailers that read UNCL ED. 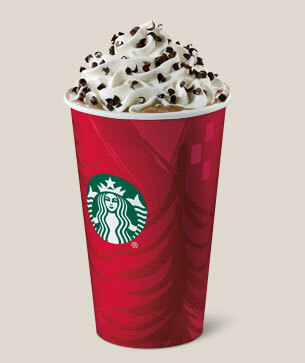 Starbucks Peppermint Mocha. Ah yes, Starbucks… One of my newer traditions, especially this year since I was getting spammed with extra bonus stars every time I got one. Going to eat Chinese Food on Christmas Day. I started this about two years ago, when I was feeling a bit under the weather and the rest of my coworkers were getting full blown flu. I went there for the big pot of tea and the won ton soup. Now I take my mom there and we plan to go again this year. Edel-Marzipanstollen from Trader Joes. This blog post covers just about all the Xmas goodness from Trader Joes, including the stollen. The blogger, as I do, appreciates Trader Joes unabashed use of dark chocolate (not on the stollen, just on everything else)! See the Christmas tree in the Metropolitan Museum of Art. This was and still is a big deal for a lot of people visiting NYC this time of year. I haven’t been able to visit it in a long time, but I do hope to be able to get back to the city for the holidays someday. Barnie’s Santa’s White Christmas Coffee. I have a k-cup waiting for the right moment, but it’s just not the same as it used to be when I was shopping in the mall and stopped for a cup at the Barnie’s Coffee place. 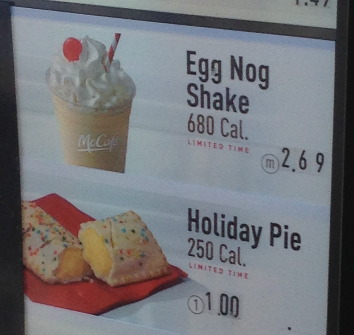 McDonald’s Eggnog Shake. It’s not the same as it used to be either, especially since now they have right on the sign that the shake is 680 calories. Jeez, isn’t that what we make New Year’s resolutions for? Latkes and Hanukkah Gelt. Yes, Trader Joes has latkes as well. But nothing beats home made potato pancakes with applesauce or sour cream. We can even get fancy with this recipe from Food & Wine. And Trader Joes has the Hanukkah Gelt chocolate with world coins, but I remember these, because these have the menorah on the coins. Though they are milk chocolate, nothing quite tastes the same as these foil wrapped chocolate coins do. You can get these at Amazon, the bane of my existence Earth’s Biggest Selection. I’m sure there are more things I do and have done that I didn’t post about yet, but maybe I can make a part 2 to this post. What kind of traditions do you have that you miss, or have you started to take place of others?